The Kansas Department of Transportation is advising motorists to expect delays on state highways 31 and 170 through mid October as a resurfacing project is under way. The project began Monday on an 8.5-mile stretch of K-31 from U.S. Highway 75 to Osage City. KDOT is advising the highway will be reduced to one open lane for both directions for resurfacing work. 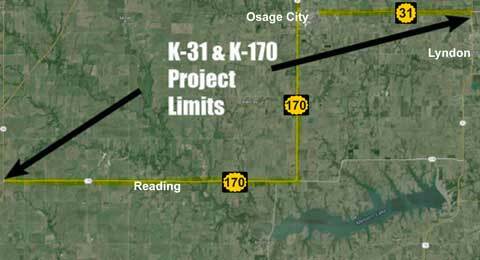 Work will also take place on a 1.5-mile stretch of K-31 from the U.S. 56 junction to the K-170 junction in Osage City. Expected to begin next Monday, Sept. 28, a 24-mile stretch of K-170 from the junction with state Highway 99, in Lyon County, to the K-31 junction in Osage County, will be reduced to one open lane for the project. Resurfacing began at the east end of the project starting at the K-31 and U.S. 75 junction and will move west to the K-99 and K-170 junction. Project work includes the milling of 3/4 inch of existing asphalt pavement followed by a new 1.5-inch asphalt overlay. Milling work will take approximately one week, followed by one week of overlay work, followed by pavement markings, weather permitting. Project work will take place during daylight hours, Monday through Friday, with some occasional Saturday work. The work will be coordinated so that all lanes will be opened to traffic by one-half hour before sunset. Traffic will be directed through the project work zone via a pilot car and flagger operation. Drivers should expect delays of up to 15 minutes maximum and are encouragedto use alternate routes, if possible. There will be an 11-foot lane width restriction and a reduced speed limit on the portions that are directed via the pilot car and flagger operations. No large structures or superloads will be allowed through the project work zone. Chester Bross Construction, of Hannibal, Mo., is the primary contractor on this resurfacing project.